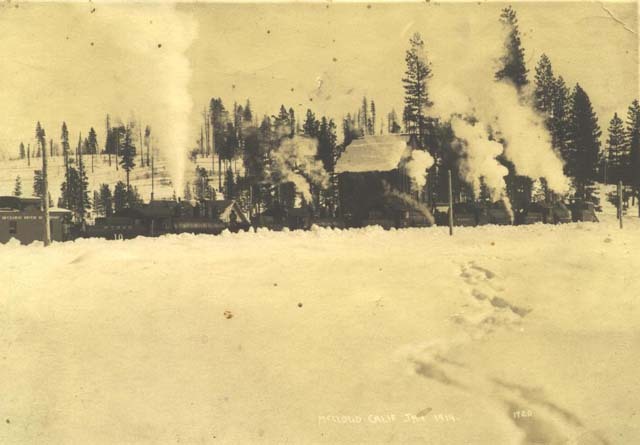 Winters tended to be harsh around in the McCloud country. 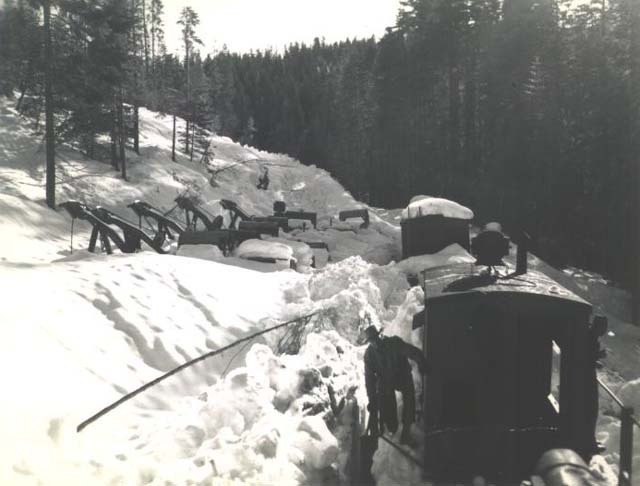 The McCloud River Railroad elected to shut down during the first several winters, but after a few years the company accumulated the necessary snowplows to maintain year round operations. Here are some photographs of snow removal operations during the winter months. 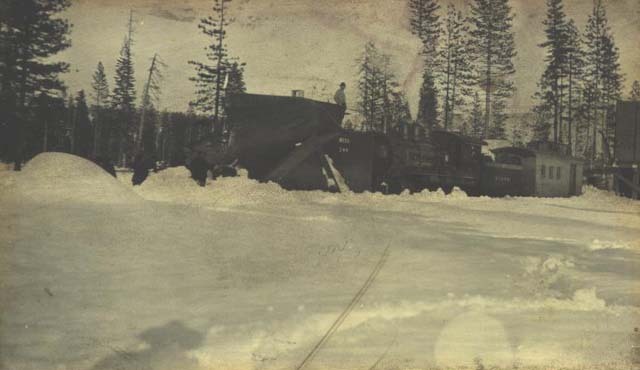 A locomotive and one of the small bucker/flangers has plowed up to some tractors and arches buried in snow at a landing site. 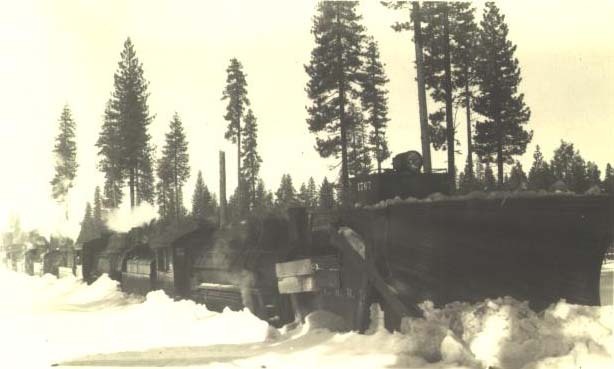 A plow train at one of the camps east of McCloud. The #11 and two other small prairies pushing a plow and pulling a log train on a trestle east of McCloud. 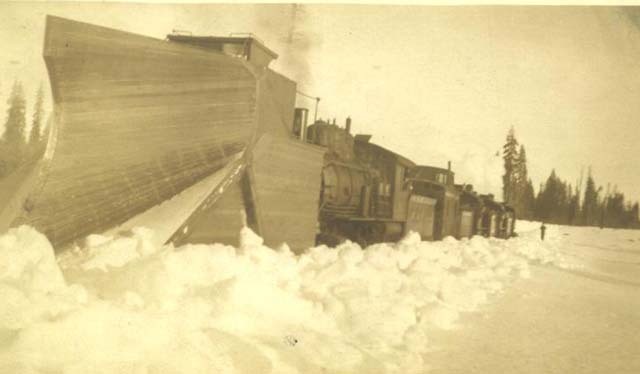 The most effective way to use a bucker plow was to push the plow through the snow until the plow train stalls out. The train would then back up the line a ways before taking a running start at the snowbank that stalled the train in the first place. 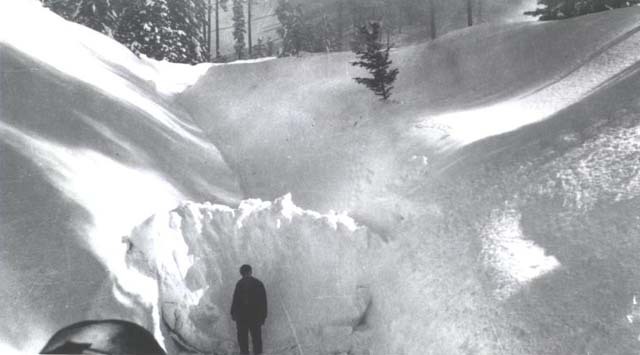 Some drifts required numerous "runs" into a snow bank before the plow broke through. 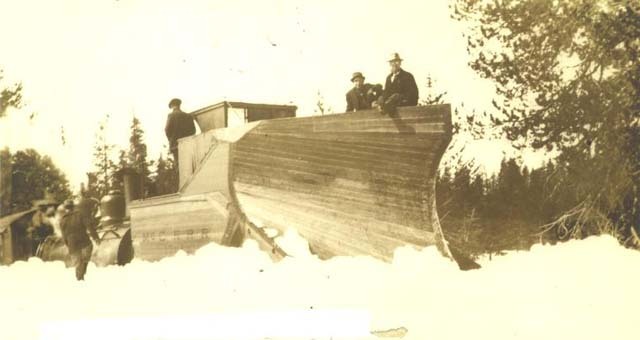 This photograph is looking at one such jam from the deck of one of the bucker plows. When all else failed gangs of men would be called in to shovel snow. This crew appears to be digging out a junction switch somewhere along the line. 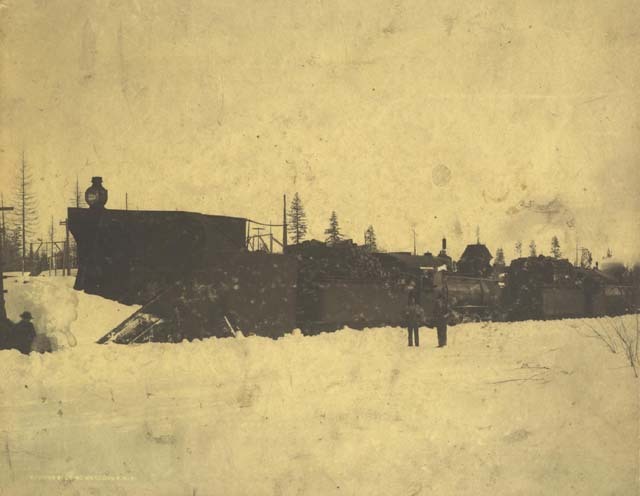 Four locomotives and a caboose pushing a plow. Another shot of one of the buckers doing what it was built to do. 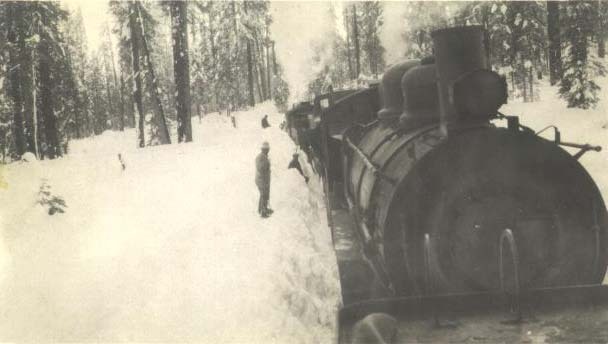 One of the early mikados pushing a bucker plow and pulling a caboose and flanger #1773. Looking back from a plow at the power. 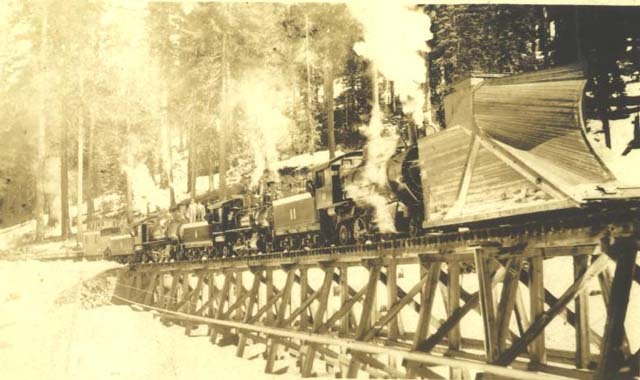 Five locomotives powering a plow train. 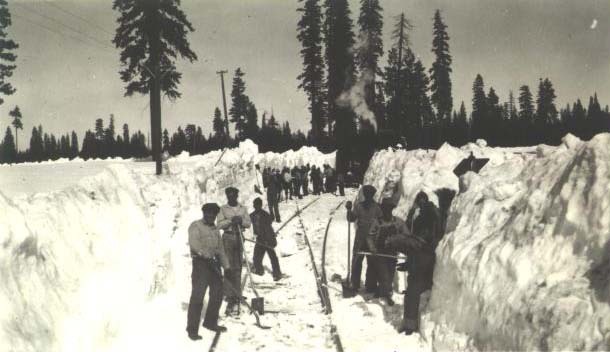 An early shot of McCloud snow removal operations.